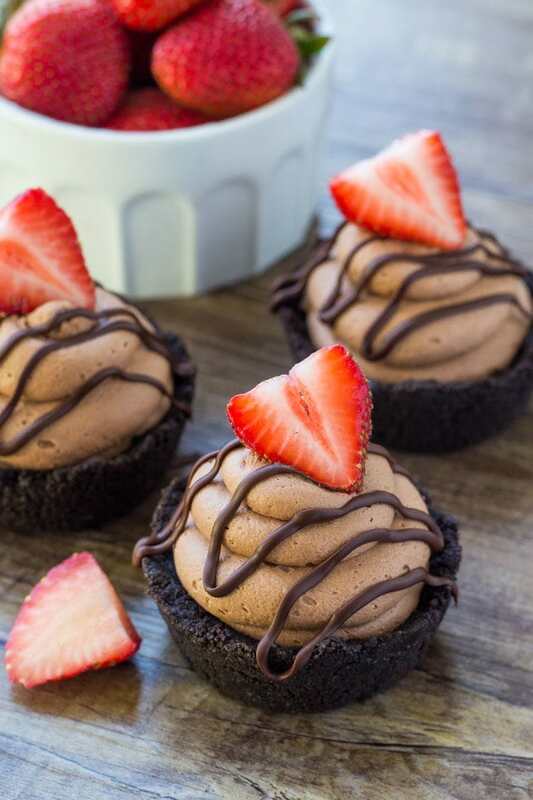 These no bake mini chocolate cheesecakes are smooth and creamy with a crunchy Oreo cookie crust. 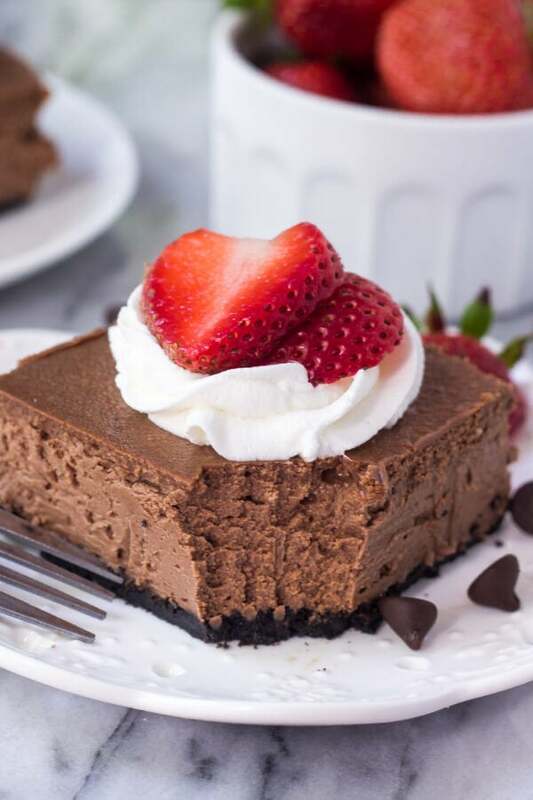 Perfect for Valentine’s, or whenever you’re looking for an easy chocolate cheesecake recipe. 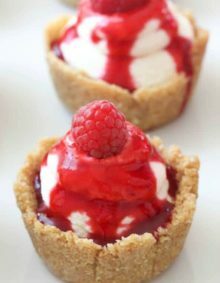 Last spring I saw these absolutely adorable no-bake mini cheesecakes with raspberry sauce that Carrian posted. And after trying the recipe – I was in love. So, I thought it was only fitting to make a chocolate version to share with you. The recipe for these no bake chocolate cheesecakes is really easy. First we make the Oreo crust be pulsing Oreo cookies in the food processor. Or you can place the cookies in a ziploc bag and crush them using a rolling pin. Mix the crushed cookies with melted butter, and we’re ready to make the bases. 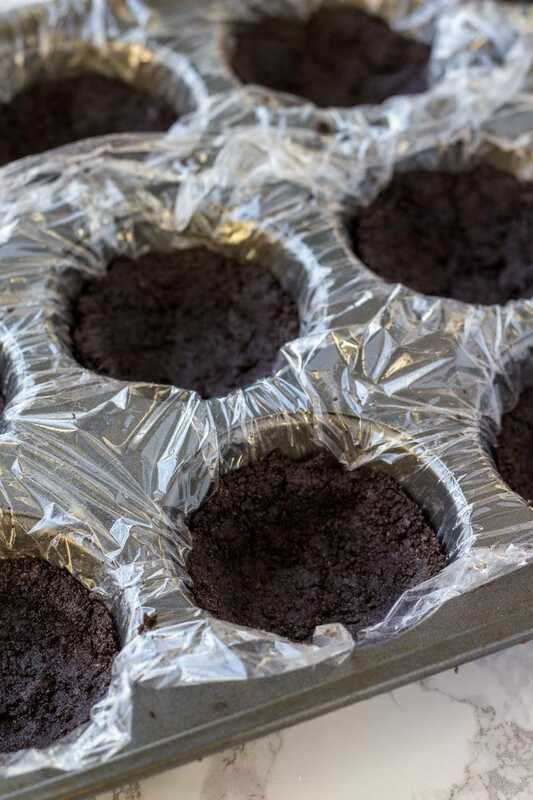 Line a muffin pan with a sheet of plastic wrap (or 2 depending on size). The plastic wrap makes it really easy to remove the cheesecakes from the pan later on. Spoon the Oreo mixture into each well, and press it down with your fingers to form a base and up the sides about 1/3 to 1/2 of the way. It’s like a little cup or tart shell shape. Then pop them in the freezer to harden. Then for the cheesecake filling, first whip the heavy cream until stiff peaks form. In a separate bowl beat together the cream cheese and powdered sugar, then beat in the sour cream and melted chocolate. I used 6 oz of semi-sweet chocolate, but if you prefer a richer chocolate flavor you can use 3 oz of semi-sweet and 3 oz of dark chocolate. Then carefully fold in the whipped cream, and the cheesecake filling is done. Spoon the mixture into each crust, or you can place the cheesecake filling into a large piping bag and pipe it on top (that’s what I did). Then pop them in the fridge (or freezer) to chill, and we’re all done. 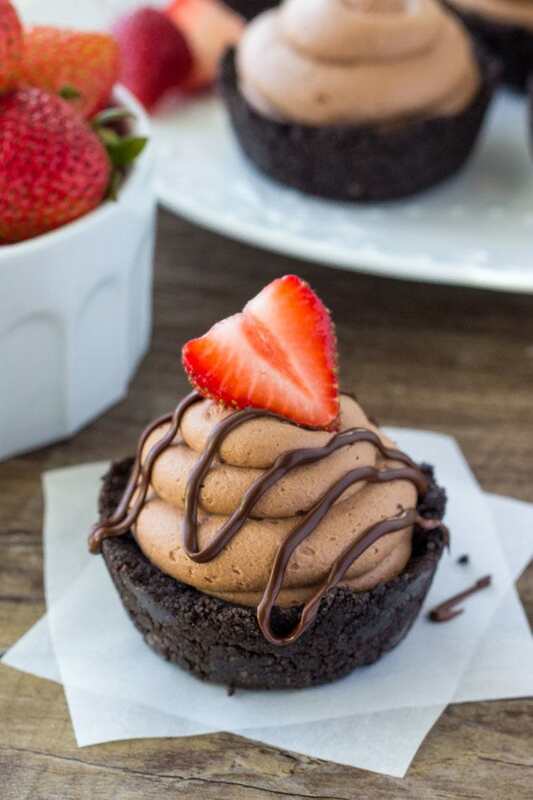 I topped mine with a drizzle of melted chocolate – but they’re also delicious plain, with fudge sauce or fruit sauce. 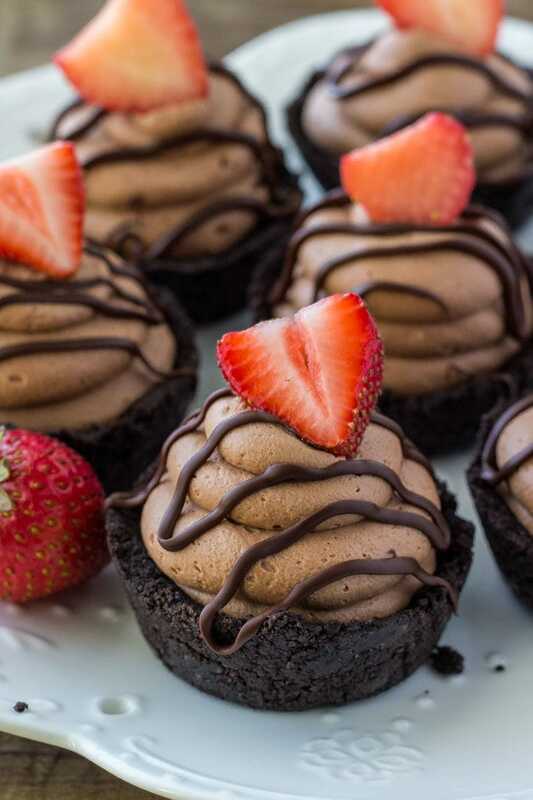 These mini chocolate cheesecakes are great for parties and entertaining since they’re already perfectly portioned and ready to serve. You’ll love the creamy chocolate flavor, Oreo crust, and drizzle of chocolate – plus, I think any miniature dessert is hard to pass up! Crush the Oreo cookies in a food processor. Stir the crushed cookies and melted butter together. Line a muffin pan with a sheet of plastic wrap (or 2). Spoon the Oreo mixture evenly in the wells to get 10-12 total. Press down with your fingers to cover the base and about 1/3 to 1/2 up the sides. 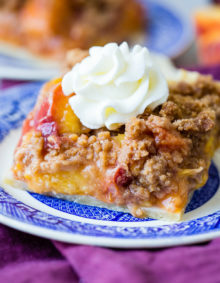 Place in the freezer to harden as you make the filling. In a separate bowl beat together the cream cheese and powdered sugar. Beat in the sour cream and melted chocolate. Turn off the mixer and carefully fold in the whipped heavy cream. 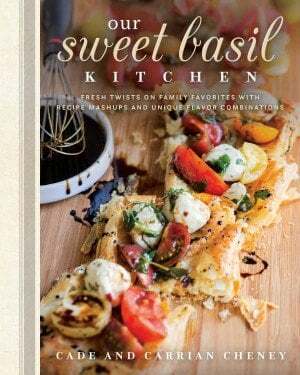 Spoon the cream cheese mixture into each crust, or spoon the batter into a piping bag and pipe the cheesecake into each crust. Place in the freezer to chill for 30 minutes, or in the fridge for 60 minutes (or longer). Carefully life the plastic wrap up to release the cheesecakes. Drizzle each cheesecake with melted chocolate and top with a strawberry. *Cheesecake can be stored in an airtight container in the fridge. If you’re looking for another delicious, no bake mini cheesecake recipe – then this recipe is for you! 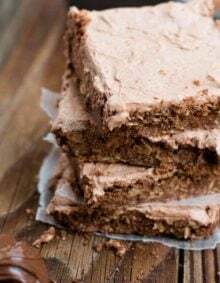 Or if you love chocolate cheesecake – try these chocolate cheesecake bars. 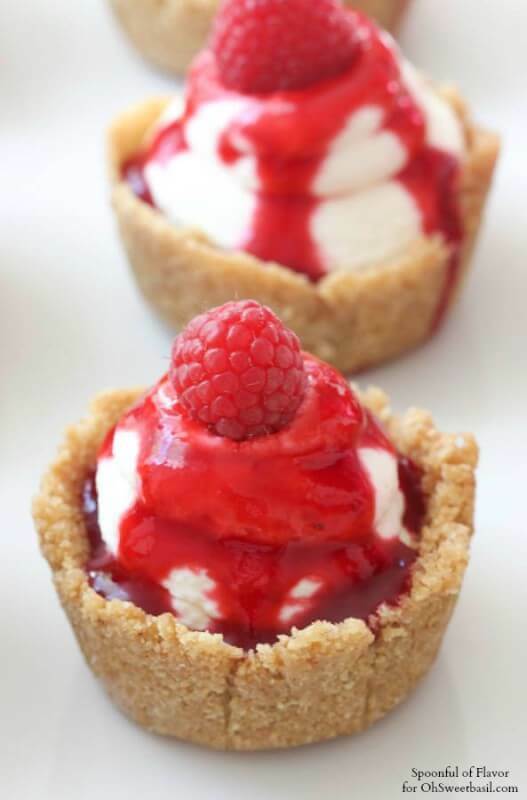 Such a lovely no-bake cheesecakes for Valentine!! 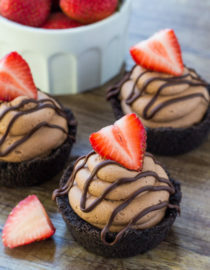 Anything no bake is straight up my list! Thank you for sharing such a hearty recipe, Carrian, and Cade. These are so simple yet look so scrumptious! Thank you so much for this most best ingredients..I will definitely try this.